The Great Wall of China is the longest wall on Earth, and, as its name implies, is located in China. It has two names in Chinese: the official (Traditional Chinese: 萬里長城; Simplified Chinese: 万里长城; Pinyin: Wànlǐ chángchéng) which means "the long wall of 10,000 Li", and an alternative (Traditional Chinese: 長城; Simplified Chinese: 长城; Pinyin: Chángchéng) which means "Great Wall". The wall has made a few appearances in the Mario franchise. 2 Pamphlet information from Mario is Missing! 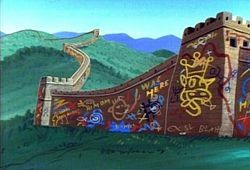 The Great Wall first appeared in an episode of The Adventures of Super Mario Bros. 3, "7 Continents for 7 Koopas". When Bowser tries to conquer the entire Real World, he puts Bully Koopa under control of Asia. Bully vandalizes the Great Wall of China by spraying graffiti all over it. Mario later steals Bully's wand, and turns the wall into a giant dragon, which then attacks and tries to eat Bully. Ironically, this could be seen as damaging the wall even more than Bully did. However, it is seen that later the wall and dragon both appeared at once (in the error screen (which happened due to the heroes' victories) and Bowser's defeat), though it is not explained how. The Great Wall of China in the SNES version of Mario is Missing! 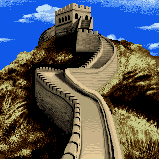 The Great Wall of China in the DOS version of Mario is Missing! When did the building of the wall begin? About how many men did it take to build the wall? One of the world's seven great wonders, the Great Wall is the only man-made object visible from outer space. The Chinese poetically call it "Long Wall of Ten Thousand Li." It is said that over 300,000 men labored for ten years to complete its 3,946 miles. Begun in fifth century BC, its purpose was to keep northern tribes from attacking southern states. The Wall is wide enough to allow a team of five horses to run, side by side, along its top. This way, messengers could bring food and information without slowing down too much! Note: The pamphlet says that the Wall is "the only manmade object visible from outer space", and a Beijing boy too claims that it is "the only manmade thing on earth an astronaut can see from space." This, however, is actually debatable. This page was last edited on September 30, 2018, at 17:39.